Nutrition is vital to a person’s health regardless of age. Babies and children need the right nutrition for growth and development of the body’s vital organs. Adults need the right nutrition to protect the body against certain illnesses while giving the body the much needed energy. In the elderly, nutrition plays an important role to maintain a healthy weight, stay energetic, get enough nutrients and lower the chances of developing chronic health conditions associated with aging, like heart diseases and diabetes. When the body doesn’t have enough nutrition, you can become either overweight or underweight, which can weaken your muscles and bones, and make you prone to diseases. Eating the right foods is key in longevity and amazing health. Your senior years would be more pleasurable when you’re free from health problems brought about by poor nutrition. As an elderly adult, your diet should include more fiber, vitamins, minerals, and other nutrition packed foods. The important food groups below will give you the best idea of the specific food to eat. Vitamin C is very important in an elderly person’s diet. While it contains antioxidants that prevent cancer and heart diseases, it also helps in the production of collagen to make the skin elastic and get rid of dead cells. As you grow older, your skin becomes less elastic and easily gets wrinkles. Vitamin C may not prevent you from aging, but it can delay the onset of a premature one. 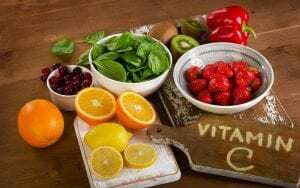 Aside from that, vitamin C can also reduce the duration and severity of colds, help in the formation of white blood cells that fight off infection, and help keep the wall of the blood vessels strong against possible damages. Taking vitamin C on a regular basis is of vital importance in your senior years. For men, the recommended daily dose of vitamin c is 90 milligrams. For women, it’s 75 mg. If you don’t want to take vitamin C in a capsule form, you can take it from various sources that are high in vitamin C. Fruits that are high in vitamin C content are citrus fruits, papaya, kiwi fruit, strawberries, and tomatoes. Vegetable sources of vitamin C include broccoli, Brussel sprouts, cauliflower, green and red peppers, spinach, cabbage, and other leafy greens. Other food sources are sweet and white potatoes and winter squash. Iron plays a crucial role in the proper circulation of your blood. Iron helps produce hemoglobin, which is responsible for carrying oxygen in the blood from the lungs to the other parts of the body. A deficiency in iron affects the supply of oxygen to the body tissues and may result in anemia. Though anemia in the elderly can be caused by some other factors, iron deficiency is one of the most common cause. There’s been a lot of issues regarding whether elderly people should take iron supplements or not. If iron supplements seem unsafe for you due to certain medications or other health concerns, getting your iron supply from natural sources is the best option to take. You can get iron from animal food sources, like chicken liver, beef liver, oysters, beef chuck, dark turkey meat, sirloin steak, tuna, crab, and pork. For seniors who have turned vegan, the best sources are fortified cereals, fortified oatmeal, soybeans, lintels, kidney beans, lima beans, navy beans, black beans, pinto beans, and blackeye peas. Other sources are tofu, spinach, raisins, molasses, white bread, and whole wheat bread. If you’re above 51 years old, the recommended daily dose of iron is 8 milligrams daily. Iron is best paired with vitamin C food sources for maximum iron absorption. Vitamin D is essential in an elderly person’s health because it helps calcium absorption in the body and maintains bone density. A lack of vitamin D may put a person at higher risk of osteoporosis, which is a chronic skeletal disease that reduces bone mass and may result in bone fractures. Vitamin D also protects the body against multiple sclerosis, type 2 diabetes, cancer, and rheumatoid osteoporosis. You can get your vitamin D from fortified foods, like cereals, milk, yogurt, and juices. Other sources are eggs and fish, such as tuna and salmon. The sun is also considered a good source of vitamin D. You can get the most of it during sunrise while the rays of the sun are not yet too hot. Otherwise, too much sun exposure is linked to skin cancers. It’s of much importance that you get a regular dose of vitamin B12 as you get older. Vitamin B12 aids in the production of red blood cells and ensures the proper function of the nerve cells. A deficiency in this vitamin may result in various health conditions in the elderly, such as anemia, neuropathy, or cognitive impairment. These problems can happen when there are problems in the red blood cells or nerve cells. Although B12 is stored in the body for a longer period of time, it can run out when the body is processing lesser of this vitamin. The ability of the body to absorb B12 decreases as you advance in age, especially when you’re starting to have problems with stomach acids and enzymes, which are the prerequisites of the processing of B12. A deficiency of this vitamin in older adults could not be easily diagnosed because the symptoms may be similar to some other health problems. 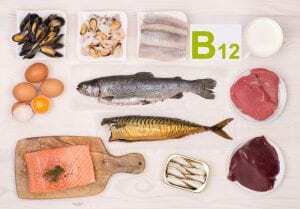 To make sure you’re not getting low on B12, have a doctor check your B12 levels. Your doctor will recommend doses of B12 supplements when you’re not getting enough of it. You can also source B12 from natural animal products, like fish, meat, poultry, eggs, milk, and milk products. It’s not present in plant-based food sources, but vegans can get it from fortified breakfast cereals. Omega 3 fatty acids are an anti-inflammatory that helps fight against cancer, arthritis, and heart disease. They also help reduce macular degeneration and dementia. Omega 3’s can be found in fish, such as salmon, herring, tuna, and mackerel. They can also be found in plants, like walnuts, soybeans, canola oil, and flaxseeds. Unlike other vitamins, which are to be taken on a daily basis, health experts recommend a serving of the omega 3 at least two times a week. In addition to these food groups, elderly should include in their diet calcium, fiber rich foods, potassium, magnesium, and best of all water. These foods may not take away your diseases but including them in your diet, help you fight against degenerative diseases that may already be harming you. A proper diet coupled with a healthy lifestyle also ensures longevity and optimum health even in your senior years.